XnView is quite a versatile image organizer which supports hundreds of file formats. As such, photo management is what it's best known for. However, one of its least known features is that of a duplicate image finder, or more accurately, Find/Search Similar Files as the developer puts it. Unlike some other free duplicate finders that rely on just file names and file attributes (extension/format, creation/modification dates etc.) 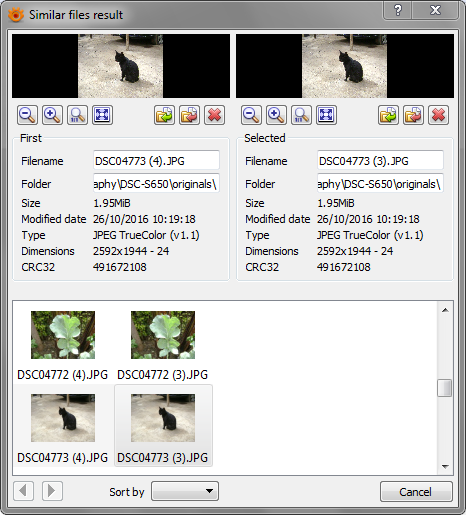 on finding duplicates, XnView goes a step further by looking in the file data and picture content. I presume the former compares image metadata, dimensions, CRC32 checksum etc. while picture content compares the actual visual data (i.e. visual similarity as one does with eyes). While the software is quite good at finding duplicates, it comes with one major downside: the deletion process is entirely manual in that you've to delete the duplicates one by one. This is a small issue for those working with small collection of images however for large collections this may prove daunting. To find duplicates using XnView or XnViewMP do the following. 1. If you haven't yet installed XnView, you can get if from the official page here. It's available on Windows, Linux and Mac OS X and comes in two flavours XnView (Classic) and XnView MP (Multi-platform) which are almost identical in features though the latter supposedly has better performance. A portable version is also available for those on Windows. I'll be using XnViewMP for the purpose of this tutorial - it's image compare implementation is more intuitive than the one in the classic version. 2. Run the software and in the toolbar select Tools then Search similar files... or Find similar files... in the classic version. 3. That should open a small window to add the files to compare. You can add images using the Add files... button or folders containing the images using the Add folder... button. 4. 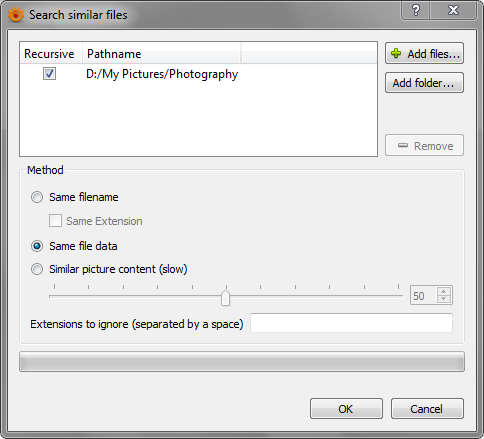 Below it select the method/algorithm to use to find the duplicates then select OK.
Use Same filename if you're comparing images that use a similar file pattern or that are contained in different folders. For better accuracy however, use Same file data which is more accurate and relatively fast. If that doesn't yield results you can try the last option Similar picture content which is more accurate but slower. 5. Give it some time and that should open a results Window with the duplicates it has found along with a summary of the similar data. You can also visually inspect the two images here (e.g. by zooming) should you want. 6. To delete the duplicate, you can click on the delete icon beneath the two preview pictures. If you've more than one duplicate, you can also right-click the duplicates in the results and select Delete file. To change the picture that is used as the original (reference), right-click it and select Use as Reference. You can then select the duplicate and delete it. On the other hand, if you don't want to delete the file, you've the option to copy or move the file to another folder using the icons beside the delete icon or from the right-click menu shown above.